Those looking to build a low-cost, lightweight media server will be pleased to see that OpenELEC 4.0.0 (32-bit) and OpenELEC 4.0.0 (64-bit) have been released. OpenELEC provides a complete Linux-based distribution based around XBMC that takes up a mere 125MB thanks to the fact it’s designed specifically for running XBMC and nothing else. 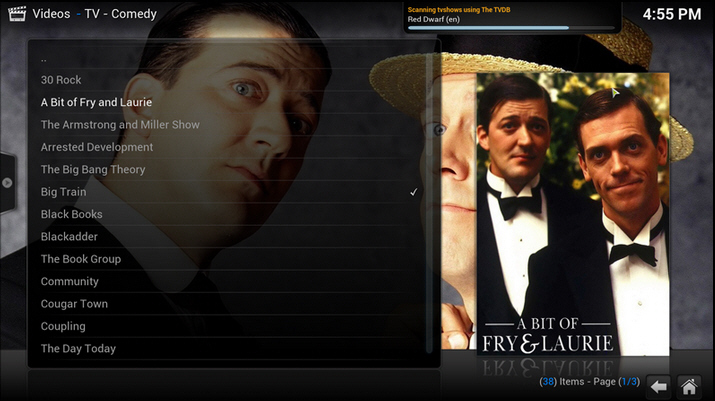 Version 4.0.0 includes the recently released XBMC 13.0 FINAL and includes several under-the-hood changes of significance. The biggest change to OpenELEC 4.0.0 is the completely reworked build system. This doesn’t just fix outstanding issues, but makes it easier for the development team to add new features going forward. It also leads to a simplified number of builds, with specific builds for certain chipsets (including NVIDIA ION, Intel and Fusion) now removed, with support rolled into the generic 32-bit and 64-bit builds instead. Virtually all component packages used in OpenELEC have been updated to their latest versions for improving hardware support and improving stability. These include non-kernel wireless drivers and support for newer networking chipsets as well as wider support for remote control devices. A new package -- systemd -- has now been implemented for greater control over startup, shutdown, power management and hardware detection and configuration. Graphics improvements see both NVIDIA and Intel GPU drivers updated to newer versions, while AMD support has been radically overhauled by switching to a new open source driver (VDPAU) that is smaller, speeds up boot times and brings numerous improvements in stability, features and performance. Initial 4K support has also been added. Aside from including the latest build of XBMC (version 13), all embedded PVR add-ons have been updated and the OpenELEC settings add-on has also been refined. Both OpenELEC 4.0.0 (32-bit) and OpenELEC 4.0.0 (64-bit) USB drive creator tools are available now as free, open-source downloads for Windows, Mac and Linux.